To fully realise the advantages of industrial Fiber Laser welding the design of products can be changed to reduce weight, dimensions cost and environmental impact. 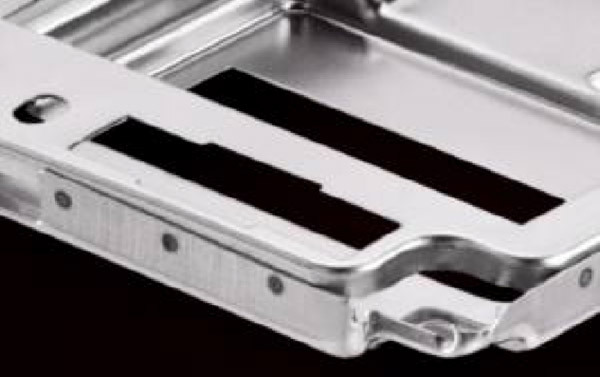 Of course not one single material joining technology can solve every joining challenge but the Fiber Laser along with good industrial design can produce benefits in a product lifecycle well beyond the initial manufacturing stage. Higher quality welds achieved in less time for less cost and less energy input. This ensures a small or zero heat affected zone which entails minimal shrinkage and distortion of the workpiece. As shown in Figure 2 a traditional flange can be reduced from 14.5mm when Resistance Spot Welding (RSW) is used to 8mm when a Fiber Laser is introduced. The weld nugget produced by RSW has a larger cross sectional area at the material interfaces but a smaller overall weld volume when compared to the full length weld that the Fiber Laser produces. The reduced material cost and weight benefits produced due to the use of Fiber Lasers last for the lifetime of the product. The technique from section 4 can be extended to completely remove a flange, which not only saves material but can improve the appearance of the product. An example of this can be seen in figure 3. A disadvantage of this type of process is that the positional tolerance of the components must be increased to ensure the welds are successful, though generally the increased strength, reduced material costs and advantages of single sided processing more than compensate for this. Weight, material and costs savings are particularly desirable in the automotive market so it is not surprising that this industry has been at the forefront of Laser use in joining applications. Cars are being designed with more weight saving aluminium but still require the strength of steel in critical areas. This of course means multi-material joining which Fiber Lasers excel at.